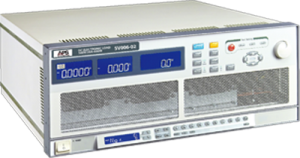 Adaptive Power Systems (APS) offers and extensive line of power centric test equipment covering a wide range of applications. Power Test Product categories offered include AC Frequency Converters and AC & DC Sources, EMC Test Systems and AC and DC Electronic Loads. We pride ourselves on offering industry leading yet cost effective solutions to meet your power test needs. Our products are backed by a global network of sales, service and application support specialists and representative. Adaptive Power AC power sources and solid state frequency converters provide frequencies and voltages found around the world and in defense, commercial aviation and shipboard AC power systems. The AC/AC converters will accept multiple frequency and voltage inputs, offer fully adjustable output frequency and a very broad adjustable voltage range that permits the duplication of worldwide utility configurations. Models with both AC and DC output modes are available as well (CFS Series & CPS Series). APS power sources are available in power levels from 500VA to 180kVA. 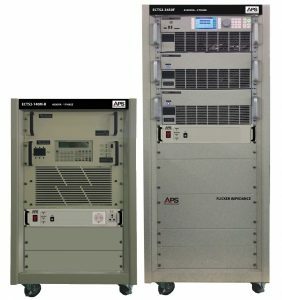 Adaptive Power Systems offers an extensive line of programmable electronic loads for DC and AC load applications in R&D, ATE and Product environments. Our loads offer leading edge features and capabilities for a wide range of voltage, current and power needs. Available in power levels starting at 150W all the way to 100’s of kWatts. Easy front panel operation and GPIB, USB or LAN interfaces support both Lab and ATE requirements. 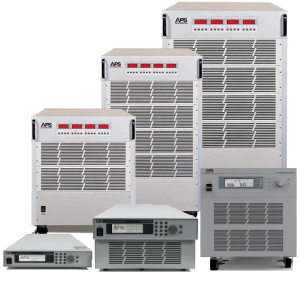 Adaptive Power Systems offers an extensive line of programmable DC Power Supplies for applications in R&D, ATE and Product environments. Our DC power supplies offer high power density and high performance in a 3U high, 19″ rack mount form factor. 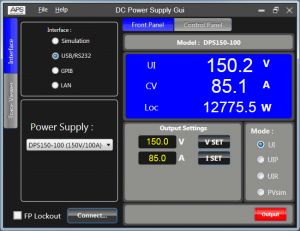 The DCS Series uses constant power range technology. This allows full output power over a wide range of voltage and current settings. The DCB Series combines a DC supply with a DC load using regenerative mode to return energy back to the grid in sink mode. This includes output or input programming, measurements, data logging, sequencing of test steps and any other functions or features that are programmable. We also offer instrument drivers of LabView for those customers that need to develop their own ATE software controlling multiple instruments from several manufacturers including APS. 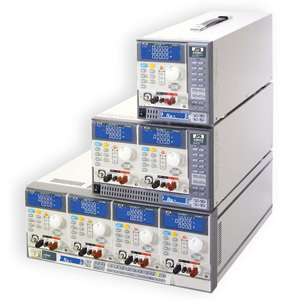 EMC Test systems are used to test AC and DC powered products for Compliance to IEC 61000-3 Emissions and IEC 1000-4 Immunity standards as required for CE Compliance. The APS EMC Test Systems are available in power levels from 4000VA to 60kVA.